Clive Steps, King Charles, Westminster, U.K.
British Prime Minister Winston Churchill is a prominent figure in the first season of The Crown, often depicted as an avuncular mentor, as he guides a newly crowned, inexperienced, young Elizabeth II in her new role as Queen. However, John Lithgow’s Emmy-winning portrayal of him simultaneously shows us the more familiar Churchill: a leader who exhibits the same strength and tenacity demonstrated in his critical tenure as British Prime Minister during the Second World War. The Churchill War Rooms (Churchill’s secret underground WWII bunker), purposefully located a stone’s throw from 10 Downing Street (the Prime Minister’s residence), are simply fascinating. Preempting the impending breakout of war, construction of the War Rooms began under the streets of Westminster in 1938, and was completed in August 1939, just one month before Britain’s declaration of war. The rooms truly capture the pervading fear and essence of the wartime era. You can stand right beside the cramped, sparse bedrooms of Winston and Clementine Churchill. When peering into the Map Room, with its extensively annotated maps, you can almost see Churchill and his cabinet crammed around the long table, carefully strategizing their next military moves. You can also peruse hundreds of documents, including handwritten letters, such as one written by King George VI to Churchill, in which he strongly advises Churchill against accompanying the British military to the beaches of Normandy on what is now commonly known as “D-Day”. This historical site is most definitely worth a visit. 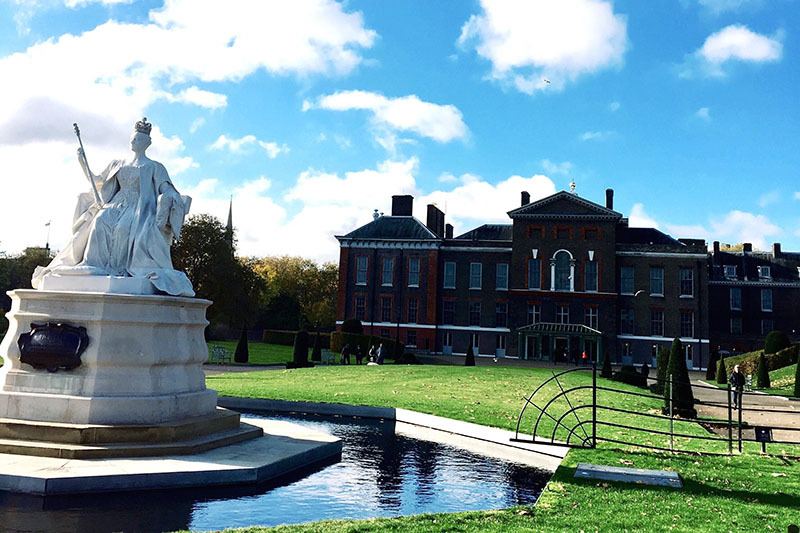 Although Kensington Palace is more famously known as the home of Princess Diana, it was also the residence of Princess Margaret for many years. In Season 2 of The Crown, we see the dramatic depiction of the unconventional relationship between Princess Margaret and her future husband, society photographer Anthony Armstrong-Jones. Princess Margaret moved to Kensington Palace with her husband in 1963, and she remained there until her death in 2002. Kensington Palace was the venue of many glamorous parties hosted by Princess Margaret, frequented by the rich and famous of the time. This imposing royal residence with its stunning formal gardens, including its famous Sunken Garden, was built in the early 17th century. Bombed and damaged in 1940 during the Second World War, the palace was renovated in the early 1960s. You can visit the palace and tour the King’s State Apartments, a wonderful assortment of opulent rooms filled with magnificent paintings, sculptures, and tapestries, which were used for both meetings and spectacular balls. You can also view a number of photographs by Anthony Armstrong-Jones (Lord Snowdon) at the National Portrait Gallery in St. Martin’s Place. You may have recognized Trafalgar Square as the location of the political demonstrations against Prime Minister Anthony Eden and his deeply unpopular handling of the 1956 Suez Crisis (Season 2 of The Crown). The series paints Eden in an unusually forgiving light, as The Crown does not depict Eden’s decisions as autocratic, but rather, focuses on how his cabinet and party abandoned him when pressure and scrutiny came upon them. Trafalgar Square is a 13th-century landmark, famously known for Nelson’s column, which stands at 169 feet high, as well as its 60-foot Christmas tree, an annual gift from Norway, which has graced the center of the square every Christmas since 1947. Favorite aspects of the Square, however, are the four massive, seven-ton bronze lions added in 1867, who sit patiently on each corner of the column’s base. If you look closely, you will notice that each lion’s face and mane is unique. Tower of London, London, U.K. Throughout The Crown series, Queen Elizabeth II dons various crowns for different occasions. In Season 1, we watch the Queen’s breathtaking 1953 coronation, where she is crowned in Westminster Abbey with St Edward’s Crown, which was also used to crown her father, King George VI in 1937. Today, you can view this magnificent crown, which weighs three pounds and contains the fourth largest polished diamond in the world, in the Jewel House at the Tower of London. There, in addition to numerous scepters, tiaras, and jewelry, you can also see the Imperial State Crown, which is worn annually by the Queen for the State Opening of Parliament.